Now that we’ve taken care of business, what are your resolutions for the new year? Eating healthy? Losing weight?? Cooking more?! Hosting more dinner parties!?! I’m going to let you in on a little secret: The recipe below does all of the above! No, this isn’t your average infomercial message — and frankly, I’m a little insulted by your asking. We just want you to accomplish your goals this year, whatever they may be. 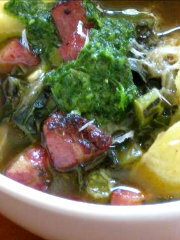 This healthy, hearty, delicious, easy to prepare, Brothy Kale Soup* is the dish to kick-off 2013. Trust us. This recipe can be found in our Soups, Salads & Pastas section! Prepare Aromatics: Cut both ends off of the onion and cut onion in half. Peel away the papery skin and discard. Thinly slice the onion into long pieces. Peel the garlic cloves and thinly slice as well. Heat ¼ cup of olive oil in a Dutch oven or large soup pot until shimmering. Add the onion and 1/2 teaspoon salt and cook until soft and beginning to brown, 10-12 minutes. Add garlic and cook until fragrant, 1-2 minutes more. Cut Kale and Potatoes: Using a sharp knife, cut the stems off of the kale. Stack the leaves of kale on top of each other, roll then cut into 1/4-inch strips. Cut the potatoes into ½ inch dice. Add the kale and potatoes to the pot with remaining 2 ½ teaspoons of salt and the black pepper. Sauté vegetables for about 5 minutes more. Simmer Soup: Add the hot stock to the pot and bring to a boil then reduce heat to a simmer. Cut the rind off of the Parmigiano Reggiano and add just the rind to the soup. Reserve the rest of the cheese for garnish. Simmer until the kale and potatoes are tender, about 20 minutes. Sauté Tasso: Cut the tasso into ¼ inch dice. Heat 2 tablespoons olive oil in a medium sauté pan. When hot, lightly sauté the tasso until it starts to get crispy on the edges. Do not add into the soup. Set aside until service. Puree Garnish: Add everything to the bowl of a food processor or blender and process until smooth. Taste, adjust seasoning if necessary. Pour into a small bowl and set aside. Serve: Lay out all of the soup bowls onto a clean work surface. Ladle the soup into bowls. Top the soup with a spoonful of the herb puree. Divide the tasso among the bowls (omit from vegetarian bowls). With a rasp, grate some parmigiano reggiano on top. Wipe rim and serve immediately. One batch serves 8. While this recipe might make enough to share, delicious flavors might have you fighting feelings of selfishness.